In The Ice Age Goddess, Kavanagh paid homage to the first three-dimensional representations of the female form ever discovered: the so-called “Venus” figures created by Cro-Magnon hunters and gatherers between 40,000 and 15,000 BCE. Ranging in size from 1.4 to 8.9 inches, most of the figures were originally carved from soft stone, bone and ivory, or formed from clay and fired. 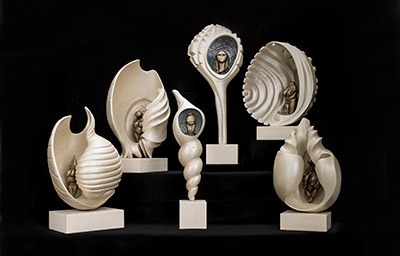 Replicating them in bronze and polymer, Kavanagh enlarged the figures and placed them in fantasy sea shells, long associated in art historical contexts with birth and regeneration. Twelve goddess figures were produced for the exhibition. They include the Goddess of Hohle Fels, the earliest known work of figurative sculpture in the world, and the goddess of Dolní Věstonice, the earliest known ceramic.